Clean up your room. Pick up your toys. Lift the seat. Put the seat down. Don't forget . . . . The list could go on and on. We all do it. We may not mean to do it, but we do it anyway. We wake up thinking the day is going to be a new beginning. We quote the verse over and over: "For his anger is but for a moment, and his favor is for a lifetime. Weeping may tarry (lodge) for the night, but joy comes with the morning" (Psalm 30:5). We even experience victory for a while. Then, about five minutes into the day, we start reminding the kids to do or not do all of the things that we told them the day before - and the day before that - to infinity and beyond. We could begin to believe that they don't hear a word we are saying. We could begin to think like Ezekiel, that we are talking to a bunch of dead bones. The scene from Ezekiel 37 must have been an interesting sight. God took Ezekiel to a battlefield in a valley. All Ezekiel saw was pile after pile of old, dry bones. God told him to prophesy to the bones. He told him that he would put the bones together and then bring life to them. I remember getting ready for church on Sunday morning and listening to the sounds of Tennessee Ernie Ford. Biscuits and ham fried in an iron skillet wafted down the hallway to the first bedroom on the left. That one belonged to me. I would come out from underneath my Star Wars protective covering and trudge to the breakfast table. All the while Tennessee Ernie Ford was singing from the record player/stereo, "Dem bones, dem bones, dem dry bones, now hear the word of the Lord. The toe bone connected to the heel bone. The heel bone connected to the foot bone." Okay, sorry. I got off track a little bit. Wait a minute. Is that Lacrae and Chris Tomlin singing Tennessee Ernie Ford? "As I was prophesying there was a noise, a rattling sound And the bones came together bone to bone . . . ." Nope, sorry. It wasn't them. Actually, it was them, but they weren't rapping to Ernie. Anyway, where was I? Oh yeah - Ezekiel. Ezekiel must have felt like we all feel from time to time when we feel like we are talking to dead bones. Maybe you are a teacher, a preacher, an employer, a parent, a deputy, or any other roles where you find yourself talking to the perpetual hand. The one thought about Ezekiel's experience is that he was getting his instruction straight from God. Sometimes we give instructions based on our own whims, our history, our traditions, or our downright selfishness. God was giving instructions based on the fact that he was about to do something brand new in the people of Israel. God told Ezekiel to prophesy to the bones. He did so, and the bones came together. They were covered with skin, but they still were not alive. Then God told Ezekiel to prophesy to the breath. He did so, and the bones came to life as a mighty army. That's what I call results!! Do you know how many times I have wondered if God will bring new life? New life in family situations, church struggles, community deadness, state trouble, national depression, and world lostness. When and how are two of the questions, but the biggest question may be "Will He bring the dead to life?" We are celebrating Easter this weekend, and we know from experience that God resurrected Jesus from the dead. As such, we have the privilege of following Him as disciples if we will lay down our lives and take up His cross. If God can bring the literal dead to life surely He can help in our families, churches, communities, state, country, and world. Right?? As surely as you just blinked your eyes, God can and will bring restoration where He chooses to do so. He will build an army where He finds people who will do life His way. I want to be part of the army of God!! To usher the Easter weekend into our church community, we are reading the Word of God aloud in our chapel. We began on Wednesday night, and we will conclude on Sunday morning with our Sunrise service. What an amazing experience this one is turning out to be for our people. The power of the spoken word of God is unparalleled. When God worked in scripture He did so by speaking into situations. When we speak God's word into our environment and circumstances, He still does miracles. Maybe this weekend you will give this one a try. What situation seems like dry bones to you? Where do you feel hopeless? Try speaking God's word into the situation. Unsure of where to start? Give this one a try: "And I am sure of this, that he who began a good work in you will bring it to completion at the day of Jesus Christ" Philippians 1:6. He started, and He will finish. Alpha and Omega, the Beginning and the End. "The foot bone connected to the leg bone, the leg bone connected to the knee bone . . . . now hear the word of the Lord." How long was a long time ago? That question came to my mind several times recently when Karen mentioned that I had not posted a blog in a long time. Having taken an unplanned Sabbatical from the blog world, I am in a bit of a quandary trying to decide where to start. To say that I am quite a different person on March 18, 2013, than I was on March 18, 2012, would be an understatement. If assurances were in the cards, you could follow this blog for the next several years and perhaps find yourself reading an entry about some of the events that have caused this boy to move into another stage of life. Another step of faith. Another place of living that has not always felt like life. Since assurances are not always in the cards, we will simply have to suppose. During the last year our family has had one constant. As a matter of fact, until about a month ago, we always knew we had one thing we count on. You might have begun to make a mental list of all of things that can and cannot be counted on in this life. No matter how extensive and creative your list might be I am certain that very few, if any, could come up with the one part of our lives that became a constant every single day of the year. His name was Senator. 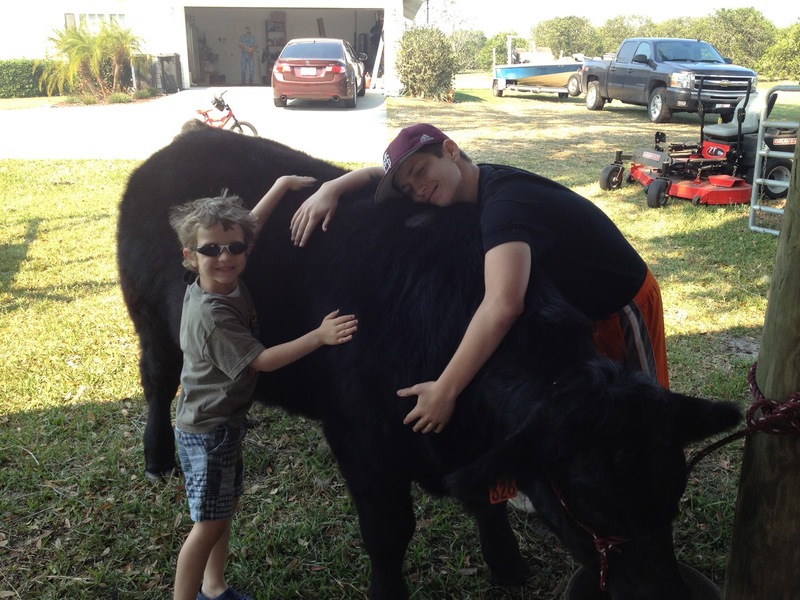 Some of you may know that Senator was the name of the steer that Daniel raised for the Hardee County Fair. Being the rancher that I am not, this project was one that Daniel had to figure out on his own. We actually came upon the steer quite by accident. Before you get the wrong idea, I don't mean that we drove up on him in the middle of the road (although Hardee County is known for unusual creatures roaming the streets - unusual animals, I mean). We've had chickens, hogs, bobcats - just your everyday neighborhood animals. Senator wasn't a roadside casualty. He showed up at a friends house with instructions that he was Daniel's love interest for the year. Unfortunately that is where the instructions stopped. There was no manual attached to him. Have you ever wondered why God doesn't provide manuals for the young of the world? Babies don't come with a manual either, you know. And before you think I've made a stretch moving from a steer to babies, think again. This steer was bathed, clipped, groomed, manicured, wiped (I know it's hard to believe) and painted by the time it was all said and done. Daniel is much better at making friends than his father is at making friends. 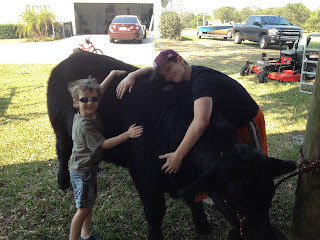 Truthfully, I think there were more people in Hardee County excited about Daniel raising a steer than there were mosquitos at the last Blood Drive in town. People really wanted him to do well, and I am proud to say that he did. During the year, Daniel learned responsibility that he would not otherwise have learned. He saw the importance of taking on a project and seeing it all the way to the end. He learned the pain of having to give up something you love very much. He experienced the excitement of a five year old brother who was convinced that "bubby" was just taking care of Senator for him since he was too young to enter him in the fair. Even Caroline got in on the action from time to time. You may wonder (or maybe you don't but you're going to have to find out anyway) why Daniel chose the name Senator. Not long before he got the steer, Daniel had the privilege of serving as a Page in the Florida House of Representatives with one of the most respected ladies in our state, Representative (now Senator) Denise Grimsley. He knew that she was running for the Senate, and so when he returned to Hardee County he named his steer with a statement of faith that Denise would win - and that he would too. The Lord has interesting ways of revealing Himself to His people. Both Senators won this year. I can't list all of the ways Daniel (and our family) grew from this experience and all of the things he learned. A couple of those lessons are worth noting, however. First of all, we learned that when people invest in you and believe in you, you can accomplish a great deal. Too many times we go through life thinking that we have to do it all alone. Look out for number one because no one else will. In some cases, that statement is actually true, but not in this case. Even when we feel like we are alone, we can remember the words of Romans 8:31. "If God is for us, who can be against us?" Second, we learned that success is determined by growth. From the first weigh in until the week before the fair, every steer had to increase a certain amount in weight. If the steer didn't make weight, the steer didn't make the show. No matter what you had done all year long, the growth was the determining factor. In our lives, God looks for the growth. He doesn't judge based on whether are not we are perfect every day. He doesn't look at all of the things we have done. Although He appreciates the journey, God is looking for growth. This growth is why He has given us His word. Second Timothy 3:16 and 17 says, "All Scripture is breathed out by God and profitable for teaching, for reproof, for correction, and for training in righteousness, that the man of God may be complete, equipped for every good work." (ESV). Jason, Bubba, Greg, David, and Ronnie said that as long as Daniel did all of the right things, the steer would make weight. He did. God says that if we will put His word as a priority in our lives, we, too, will make weight. We will. The mix of emotions came on the night of the sale. At the end of the fair, all of the steer are sold for charity. What a blessing and an encouragement to see Senator Grimsley show up to cheer Daniel on, to support his efforts, and even to buy his steer. Now that's commitment (and just one of many great things I could tell you about our friend, Denise). The story of Senator. The constant of the last year. The one thing God used in more ways than people would ever know to grow our family in trusting Him. Rumor has it that another steer is not far behind, but I am pretty sure that no steer will be as meaningful as the first steer. Thanks, Senator.